The CCC Safety Culture Assessment is designed to help leaders understand and then improve their safety culture. The value of perception surveys rests in their capacity to supply insights about how employees think about the company’s efforts in safety. These perceptions, often more than policy or procedure, determine safety performance. 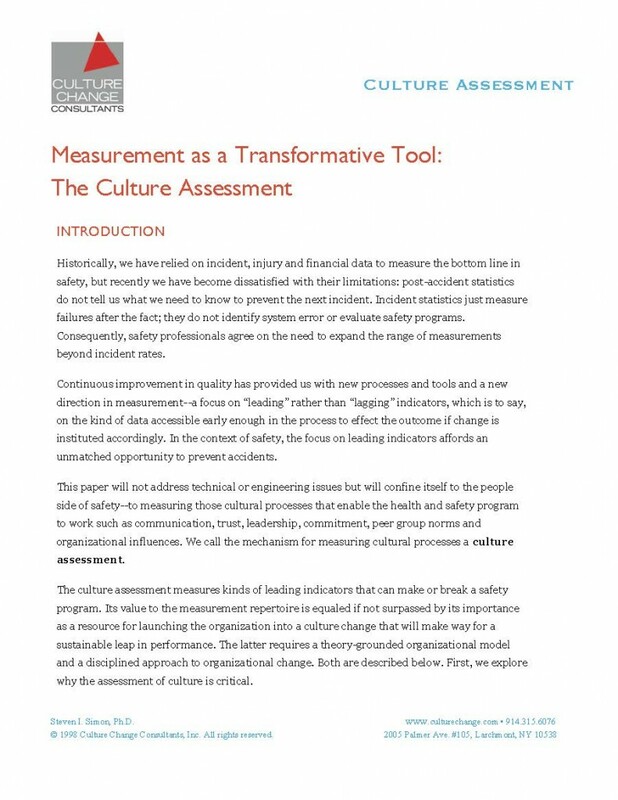 We view the Safety Culture Assessment as much more than another measurement tool; we have designed the entire process to function as a transformative culture change intervention. As a management and leadership tool to spearhead a safety culture transformation. 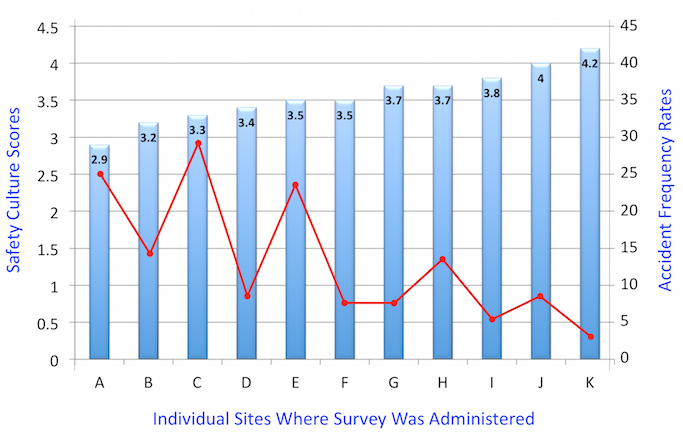 Administration of the CCC Safety Culture Perception Survey®: the 52-item survey has been tested for reliability and validity across the globe. Focus groups and interviews that provide a realistic, useful portrayal of employee opinion. 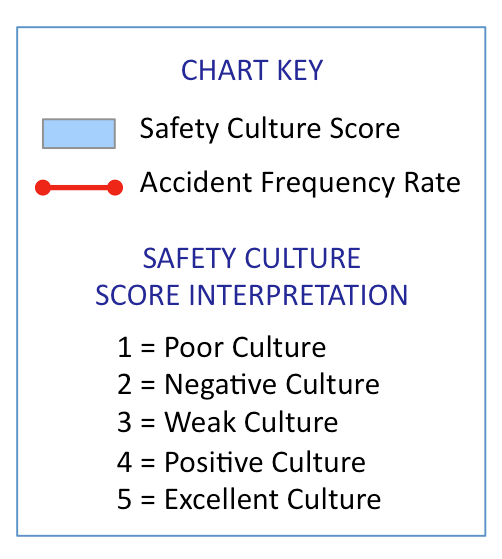 Safety Culture Assessment Report: includes complete quantitative and qualitative data, expert consultant assessment of cultural strengths and weaknesses and recommendations for both consultant-led and internal interventions for improvement. Survey Action Planning and Feedback Day: Face-to-face communication of the survey results, delivered personally in such a way that all different perspectives are validated. This is a jumping off point for the collaborative action necessary to effect positive safety culture change. The Pioneer and Leader in Transforming Cultures for a Safer Workplace: The authority of 30 years of experience in guiding companies through successful safety culture change. The CCC Safety Culture Perception Survey®: In use since 1991 and administered to more than 750,000 people at over 900 facilities whose locations span the globe. Valid and Reliable Results: The CCC Safety Culture Perception Survey® is a validated instrument. Research studies reveal that employee perceptions of a company safety culture correlate positively to employee safety performance and are a leading indicator for injury rates. A Transformative Tool to Catalyze Change: The CCC Safety Culture Assessment provides leaders with data for developing and implementing strategic initiatives. A Clearly Differentiated Approach: CCC does not use a cookie cutter method. The results of the CCC Safety Culture Perception Survey® and Safety Culture Assessment Report allow us to diagnose before we prescribe, so that recommendations for improvement are targeted to each unique organization.